Cheap Trick have filed a $1 million lawsuit against the Ottawa Bluesfest over a stage collapse during their 2011 performance at the Canadian festival. Metro News reports the statement of claim by Cheap Trick Touring Inc. was filed July 4, the opening day of this year’s RBC Royal Bank Bluesfest. The band’s touring company is seeking $400,000 for the repair and replacement of their damaged equipment, including guitars and amplifiers. They are also seeking $600,000 for special damages, which includes interim replacement, labour, and travel expenses. Groupe Berger International, Mega State International, Project X productions Inc., and two Bluesfest contractors are also listed as defendants. The statement of claim alleges that Bluesfest breached its contract with the band by failing to provide a stage that is “absolutely level, solid, and secure” at all times. 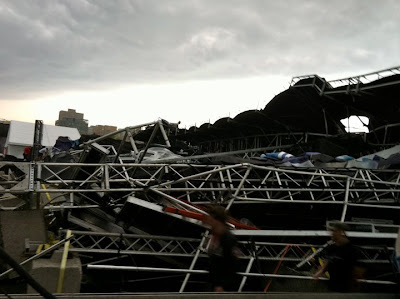 On July 17, 2011, Cheap Trick were performing when wind gusts of 117 km/h (72 mph) toppled the Bluesfest main stage, according to a Ministry of Labour report on the incident. The band narrowly escaped injury as the stage fell apart. The ministry investigation concluded that the crucial factor in the collapse was the failure to remove side and rear wind walls of the staging when the wind exceeded 80 km/h (50 mph). The stage was designed to withstand winds of up to 120 km/h (75 mph) when the side and rear wind walls were removed, according to the ministry report. Cheap Trick truck driver Sandy Sanderson sustained an injury to his abdomen and a cracked femur, and the band lost all of their equipment; Sanderson launched a $100,000 lawsuit against Bluesfest in May. Read the original hennemusic report on the incident here and watch singer Robin Zander’s video report here.